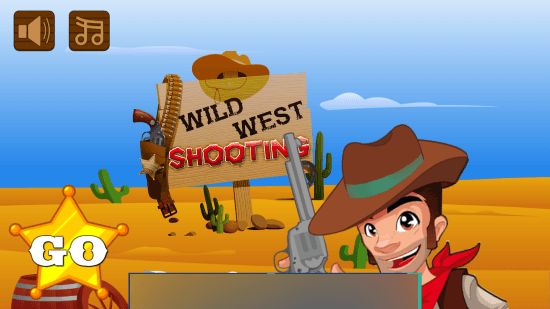 Wild West Shooting is a free Shooting Game For Windows 8 and 8.1 computers. This exciting new release from Hungry Pixels lets you put your shooting skills to test. Be one of those skilled shooters from the Wild West, take out your gun, and blow things up without wasting a bullet. Shoot random things that come up on your screen without missing any target, and be the most feared shooter. This 15.6 MB shooting game for Windows 8 is a steal for the space it occupies. Download it from the Windows App Store. 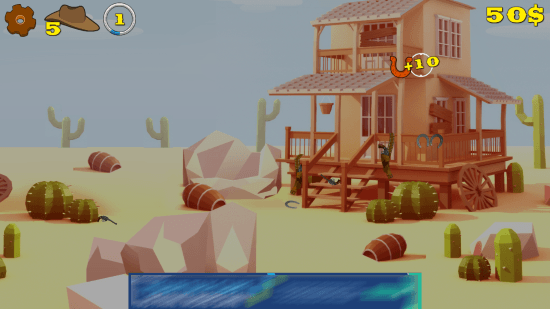 Type the name of this shooting game for Windows 8 in the search box to find it. You will also find a download link at the end of this article. After you find the game, click on the Install button to automatically download and install this game. This shooting game for Windows 8 game is an exciting App to have on your computer. The gameplay is easy to understand, but it takes time to master this game. This makes Wild West Shooting an addictive game to play. Once you hit the Go icon, Level 1 begins. As this shooting game for Windows 8 begins, a random object appears on the screen. You have to shoot the object multiple time to blow it up. You are awarded points every time you shoot and blow an object. As you move to higher level, multiple objects start to appear, and you have to shoot all of them before they fall to the ground. Whenever you let an object fall down, you loose a life. The hat at the top left corner displays the number of lives left. Random dynamite appears on the screen at times. Shoot the dynamite to gain a life. The more you shoot, more dollars you will earn. If you loose all lives in this shooting game for Windows 8, a Game Over screen appears. 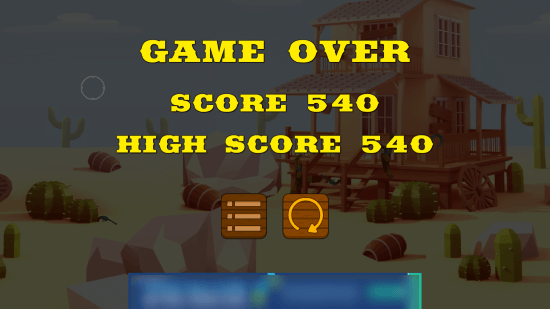 This screen displays your current score, and the highest score. So, shoot as much as you can with precision to score more points. This game for Windows 8 can be controlled by mouse. Use the mouse to move the cursor, and left click to shoot. This free shooting game for Windows 8 is not only a good entertainer, it also sharpens your reflexes. The graphic is pretty decent, so is the audio effect. 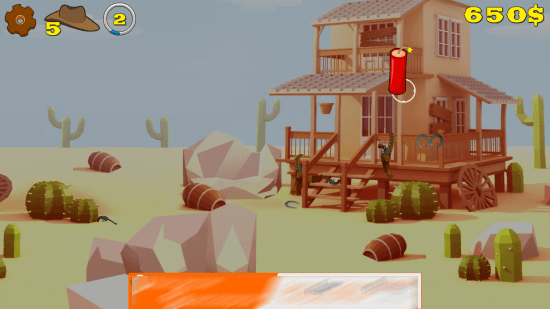 Download Wild West Shooting for Windows 8 and 8.1 computers today.